DIA100 Xytronic Lead-Free Desoldering Handpiece for LF8800 & TP Series. DIA100 Desoldering Iron, 1.2mm Tip, 32Vac Supply Voltage, 80W Power Rating, 300°C to 450°C Temperature Range, Vacuum Control is via a Push Button on the DIA80 Desoldering handpiece. 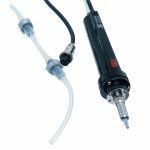 The Xytronic DIA100 suction continues for 1 to 2 Seconds after the button is released to ensure that tips and tubes are fully cleared. Specially Designed For Lead-Free Desoldering Rework. For Use With LF-8800 Soldering/Desoldering Stations. 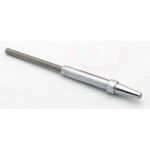 Replacement tips for this iron are 44-915410-2075, 44-915412-2075 and 44-915415-2075. Choose a Xytronic DIA100A Desoldering Iron Today.